[234 Pages Report] The market for the global industrial tapes market has increased since the last decade because of the innovations in the industry. The global industrial tapes market is projected to reach USD 58,487.11 Million by 2020, at a CAGR of 6% from 2015 to 2020. The Asia-pacific region accounted for the largest share of the total market value in 2014, followed by North America. The market in developing economies such as China and India are estimated to grow at a higher rate from 2015 to 2020 due to the growing industrialization in these countries. This report estimates the market size of the global industrial tapes market in terms of both value and volume. In this report, the market is broadly segmented based on product type, end user, application, tape backing material, mode of application, and region. Market drivers, restraints, opportunities and challenges, and market share by participant for the overall market are discussed in detail. Industrial tapes are one of the fastest growing segments in the adhesives industry, which has seen significant growth over the last decade in a number of key markets around the world. Industrial tapes are designed with various advanced solutions that can benefits manufacturers, suppliers, and consumers. The industrial tapes market has been growing with the growth of the global adhesives industry. With the increasing demand for innovative taping solutions with high strength and capacity to resist temperature changes and toxic chemicals, industrial tapes has become one of the most applied solutions for many purposes. Increasing industrialization and development of various manufacturing and business hubs in developing countries due to the availability of low cost resources have resulted in the increase in the demand of industrial tapes in the Asia-Pacific region. 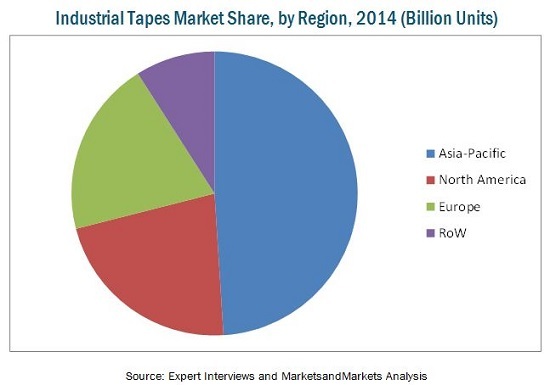 Filament tapes accounted for the largest share in the industrial tapes market in 2014. The industrial tapes market is projected to reach USD 58,487.11 Million by 2020. The Asia-Pacific region is projected to grow fastest during the forecast period, that is, from 2015 to 2020. Filament tapes are projected to grow the fastest in the industrial tapes market, because they can be used for various purposes such as closing corrugated fiberboard boxes, reinforcing packages, bundling items, and pallet unitizing. It is made of polypropylene or polyester film and fiberglass filaments which give it high tensile strength. Thus, they are widely used across businesses. The industrial tapes market is marked with intense competition due to the presence of a large number of players. The market for this industry is highly fragmented because of the small and medium scale manufacturers. New product launches and acquisitions are the key strategies adopted by the market players to ensure their growth in the industrial market. 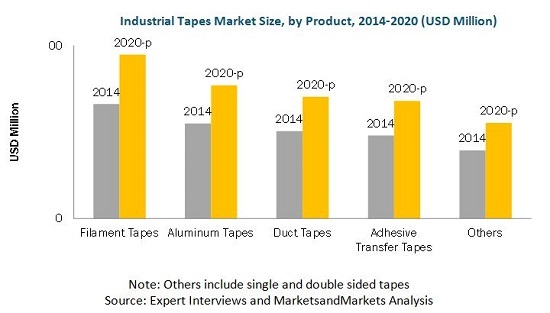 The Industrial Tapes market is dominated by several large players such as The Dow Chemical Company (U.S.), Saint Gobain SA (France), 3M (U.S.), Henkel AG & Company, KGaA (Germany), Eastman Chemical Company (U.S.), Avery Dennison Corporation (U.S.), Ashland Inc. (U.S.), Sika AG (Switzerland), H.B Fuller (U.S.), and Von Roll Holding AG (Switzerland). 8.2.7.3.1 Packaging Segment Estimated to Be the Fastest-Growing Segment in the Industrial Tapes Market in U.S.
8.2.7.4.1 Polypropylene Estimated to Be the Largest Segment in the U.S.
8.3.8.2.1 Manufacturing Segment is Projected to Be the Largest and Fastest-Growing End User in U.K.